Golbey Espinal Thaon Vosges (NM1) agreed terms with 28-year old Cameroonian international forward Franck Kouagnia (201-89). He played last season at Wetterbygden in Swedish Superettan. In 16 games he had 13.8ppg, 6.3rpg and 1.4apg. Kouagnia helped them to end the regular season as a second best team in the league. Good season as he was named League Player of the Week. The previous (16-17) season he played at Eskilstuna Basket (Basketettan) in Swedish league where in 23 games he was fourth best scorer with impressive 20.7ppg and averaged 13.7rpg (leader !!! ), 3.3apg and 1.3spg. 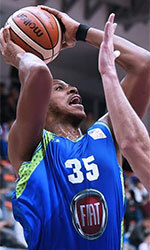 A very spectacular season in his career as he was voted Eurobasket.com All-Swedish BasketEttan Center of the Year, named to 1st TeamLeague Player of the Week (4 times). Kouagnia was called to Cameroonian Senior National Team this year. He has played previously professionally in Canada (Timberwolves) and United Kingdom (Mets).